Wellesley, Massachusetts is a residential destination community for people who enjoy exploring the great outdoors with their dogs. The town is home to more than 800 acres of open space, and two aqueducts that serve as interconnecting greenways for several trails. 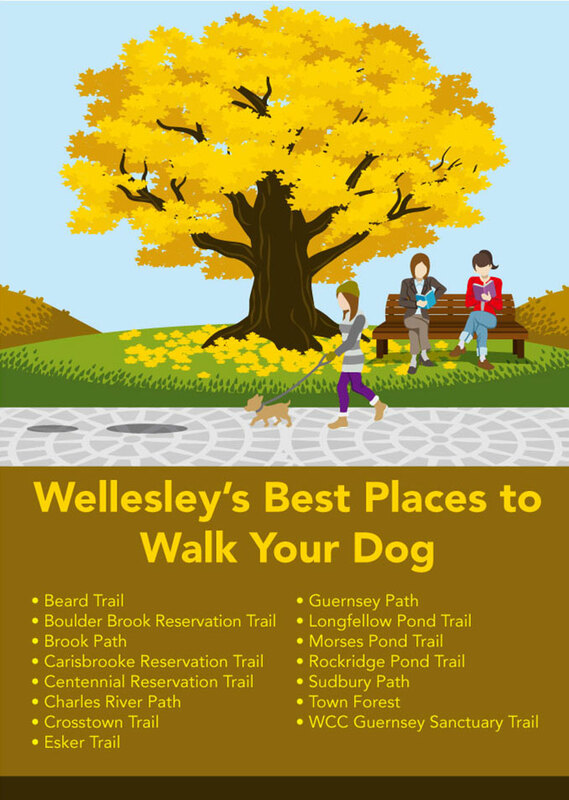 This article explores some of the best places for Wellesley residents to walk their town-licensed dogs, and provides resources and tips regarding dog safety, health and well-being. The Town’s Natural Resources Commission (NRC) maintains many of these areas, and publishes informational guides and tools to help residents and their dogs to fully enjoy the area. Free brochures and maps describing trails, nature walks, parks, and open spaces are available at the NRC office, located in the lower level of Town Hall. Map and trail guide pamphlets are available at map houses located throughout the trail system. Large copies of the Wellesley Trails and Open Space Map are available for purchase at the Town Clerk’s Office. ($5 for 24×18- inch, and $10 for 36×24-inch). Another resource is the book, Walks in Wellesley: Exploring Open Space and Trails, published by the Wellesley Conservation Council. It is available for sale at the NRC Office and the Wellesley Library (Call No. 917.44 Walks). The Wellesley Conservation Council website has more information about the organization’s history, sanctuaries and programs, and how to become a member. There are 43 miles of trails in Wellesley, and the trails network has 26 miles of marked trails with trail descriptions. Most likely a trail runs near your home, school or business. Nine woodland trails go through conservation lands, parks and open space, and five interconnecting trails run along aqueducts, parks and roads. All network trails are marked with color-coded arrow markers. Interconnecting trails have uniquely colored arrows, and woodland trails have purple arrows. Trail markers are mounted on posts, trees, telephone poles and lampposts. The Natural Resources Commission publishes a Trails Map with key details about each trail, and use guidelines. The City’s Trails Committee provides answers to Frequently Asked Questions, including information about using trails with off-leash dogs, on its FAQs page. Most of the interconnecting trails are suitable for jogging, and dog owners may enjoy jogging with their dogs. The Brook Path and trails along the aqueducts provide level surfaces with good footing, and the Guernsey Path and Beard Trail also provide good jogging routes. These trails are detailed in the section below titled: Trail Names & Details. If you enjoy long jogs, take the Wellesley Grand Tour, a 10-mile loop using all five of Wellesley’s interconnecting trails. See the Grand Tour map for the complete route. For more trail information and to report trail problems, contact the Natural Resources Commission, located in the lower level of Town Hall, 525 Washington Street in Wellesley; 781-431-1019, EXT. 2294; Website: www.wellesleytrails.org; Email: trails@wellesleyma.gov. All trails are generally suitable for dogs, based on their health and stamina. Trails are open from dawn until dusk, and all generally allow dogs to be off-leash, under the voice control of their owner. Description: A pleasant trail through the woods between Beard Way and Cartwright Rd. Connects with Ridge Hill Reservation in Needham. Description: Traverses a delightful variety of meadows, woods, streams, and craggy ledges. After crossing the meadow, the trail splits for a loop over Rocky Ledges (caution: steep drop-offs). Description: A great trail for walking, jogging, and biking. Runs along Fuller and Caroline Brooks from Dover Rd at Nehoiden Golf Course to Maugus Ave. across from the Wellesley Hills clock tower. Description: Explore rocky outcrops along Cold Stream Brook in the northern part of Town. Woodsy loop trail goes past Covati Pond. Description: Take a loop trail through woods and meadows to the top of Maugus Hill for a view of the Blue Hill. Trail goes past Bezanson Pond. Difficulty: Not difficult but not suitable for wheelchairs. Wear sturdy and comfortable shoes. Access: Just south of the intersection of Rte. 9 and Rte. 16. From the light at Rt. 9 and Oakland Street, follow Oakland Street south for 0.5 miles. Turn right at the sign for Centennial Reservation and follow a paved road to the parking lot. Description: Great hike for scenic variety. The northern half goes along the Charles River, and the southern half goes through the Town Forest. Description: Walk the Cochituate Aqueduct from Natick near Rte. 9 to the Charles River near Cedar St. Eastern and western sections follow wooded aqueduct path. Middle section, Weston Rd to Woodlawn Ave. in Wellesley Hills, follows mainly roads with sections through parks and playing fields. Description: Scenic woods loop trail runs along a high glacial esker in the Town Forest. Trail leaves the Charles River Path 0.1 miles from start at Longfellow Pond. Description: An enjoyable walk along the Charles River, under the Waban Arches to the Nehoiden Golf Course and through Wellesley College. Description: A popular loop trail around Longfellow Pond. Explore the pond ecology and other trails in the Town Forest. Access: Town Forest and Ollie Turner Park. The Town Forest is located in the southeastern part of town near the Fiske School. Start this trail from the right side of the Longfellow Pond parking lot on Oakland Street as you face the pond. Description: A popular loop walk along the Morses Pond shoreline and through pine woods. Description: Follow the Sudbury Aqueduct from Needham to Wellesley College. Eastern section goes through the Town Forest and Babson College. Western section runs through Beebe Meadow and across the Waban Arches. Description: The Town Forest and Ollie Turner Park are home to 221 acres of open space with a brook, large pond, vernal pool, woodlands, marshes, and steep eskers. The Town Forest is the largest town-owned conservation land and extends along the Rosemary Brook from north of Rte. 9 into Needham. It includes Longfellow Pond, the third largest pond in town, and the woodland trails total 4.5 miles. The three marked trails include: Longfellow Pond Trail, Esker Trail, and a section of the Charles River Path (details about these trails are listed within this article). Description: A pleasant loop trail to Sabrina Lake. Explore this diverse woodland with streams, ponds, wetlands and a vernal pool. Some of Wellesley’s most popular parks are featured in our previous article, The Complete Resource Guide for Dog Owners in Wellesley, Massachusetts. The Wellesley Conservation Council (WCC) maintains 10 sanctuaries totaling 44 acres. Eight of the sanctuaries are located entirely within Wellesley, one includes land in both Wellesley and Needham, and one is located within Weston. Currently six properties have walking trails. One is a small suburban wildflower garden. Dogs are generally welcome in these conservation lands. The town restricts the number of dogs on conservation land to no more than two dogs per person, or three dogs with a permit.